Floors are a major element in your home or business. They tie rooms together and carry a theme from one area to another. Think of how smooth the transition is from the living room to hallway, or kitchen to the dining room when they have the same type of flooring. It’s a design element used to maximum effect when the style is provided through luxury vinyl flooring in Billings, MT. Once you are ready to breathe life into your floors, visit us at The Floor Trader of Billings and take advantage of the wide range of vinyl options on display in our expansive showroom. Vinyl is designed to mimic many other flooring types. The appearance options range from stone to wood to ceramic to linen to bamboo. That means you are sure to find a selection which matches the picture you have in mind of your renewed space. Once you’ve chosen your style, then we can help with the process of luxury vinyl flooring installation by offering our list of Preferred Installers. One of the main advantages of vinyl is that it molds to subfloor irregularities for a smooth an even surface floor wide. In addition to its adaptability to uneven surfaces, it is also scratch and water resistant, so it’s ideal for high-traffic areas and areas exposed to high levels of moisture. It’s a resilient choice which provides a high level of comfort underfoot. Luxury vinyl tile gives you the classic look of flooring such as stone or hardwood, but also provides a resilient, soft surface. It comes in a wide variety of styles and provides experienced installers with the capability to install it in a variety of patterns and configurations. Vinyl is a versatile material that can accommodate any home or office floor. Composed of heavy duty 3D-printed tiles, our luxury vinyl flooring products use natural colors, textures, and high-resolution photographic prints of any desired materials. A cost-effective alternative to other flooring materials, its complex printing methods allow vinyl to emulate the look of a number of materials such as ceramic, stone, and hardwood. This empowers you to explore your design options and create a stunning interior that matches your unique sensibilities at only a fraction of the cost. 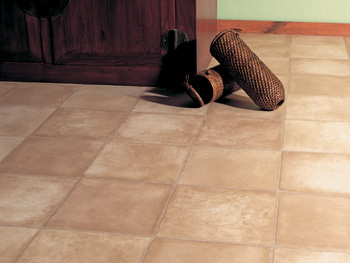 Vinyl tile flooring offers personalization at wholesale rates. Our store carries many different tiles so you are welcome to pick your favorites to create a unique pattern for your flooring. As always, our flooring consultants are available to help create a pattern and accommodate your choices to match the size and scope of your project. Vinyl plank flooring allows you to augment your favorite spaces with the look of hardwood at a fraction of the price. At our expansive showroom, we carry a number of popular brands from Armstrong™ and Mannington™. Our extensive catalog includes a variety of wood species and grain patterns. Share your design aspirations with our specialists and we’ll work with your to find the perfect grain and species to help bring your visions to life. When you’re ready for a truly unique home renovation, trust our team to take a personalized approach to your vinyl flooring installation. Serving both commercial and residential property owners, our clients know they can rest easy when they put their needs in our capable hands. Our specialists are eager to help you browse our impressive of vinyl tile flooring to find a selection that satisfies your design needs and aesthetic preferences. Whether you choose sheet, tile, or plank flooring, our team makes sure to exercise the proper installation methods. Once you’ve determined the perfect selection, we work with you to create a schedule that works best for you and your family. We consider its obligation to ensure your installation is completed in a timely manner. Turn to our amicable professionals for high-quality, timely workmanship that leaves you with a perfectly placed flooring solution. Contact to learn all about how vinyl flooring can have a dramatic impact on the appearance of your home. We proudly serve clients throughout Billings, Eastern Montana, and Northern Wyoming.